Poor Al Gore. If it weren’t for the fact that he is a genuinely evil man – not to mention a hypocrite of gargantuan proportions – who has personally benefited to the tune of hundreds of millions of dollars by hyping a bogus agenda, I’d feel sorry for the guy. The enormous winter storm that left Midwesterners shivering and crushed snow-laden buildings in the Northeast wouldn’t let go Thursday, with dozens of people trapped in a blizzard overnight on a South Dakota highway and three deaths reported when a pickup truck plunged off an icy bridge in Oklahoma. In South Dakota, people in more than 150 vehicles were stranded overnight on Interstate 29, KELO-TV reported on its website. By morning, some 70 people had been rescued, with others deciding to stay in their vehicles, which were stuck between the towns of Summit and Sisseton. Truck driver Randy Sanders said he’d been stuck since 10:30 p.m. and still couldn’t see much from his stranded truck Thursday morning. In Oklahoma, a pickup truck jumped a guard rail on Interstate 44 near the town of Miami and fell into the Spring River. At least three people died, and several others were rescued. In parts of the nation’s midsection, wind chills dipped to nearly 30 below early Thursday as the region began dealing with the storm’s aftermath. The sprawling system unloaded as much as 2 feet of snow, crippled airports and stranded drivers in downtown Chicago as if in a prairie blizzard. Even the Southwest wasn’t spared: Freezing temperatures led to school closures in parts of New Mexico when school buses wouldn’t start and delayed the Phoenix Open golf tourney in Scottsdale, Ariz.
More bad weather was on the way for some places. Parts of the southern United States, including Texas, Louisiana and Alabama, are forecast to get snow and ice late on Thursday. Officials in the Northeast had warned homeowners and businesses for days of the dangers of leaving snow piled up on rooftops. As the 2,100-mile-long storm cloaked the region in ice and added inches to the piles of snow already settled across the landscape, the predictions came true. The National Weather Service issued special advisories about “black ice” for New York and Boston. Wednesday’s standing water on many streets and sidewalks froze overnight, making driving and walking treacherous in spots. In Middletown, Conn., the entire third floor of a building failed, littering the street with bricks and snapping two trees. Acting Fire Marshal Al Santostefano said two workers fled when they heard a cracking sound. A gas station canopy on New York’s Long Island collapsed, as did an airplane hangar near Boston, damaging aircraft. Roof cave-ins also were reported in Rhode Island. The University of Connecticut closed its hockey rink as a precaution because of the amount of ice and snow on the roof. The school hoped to have it inspected and reopened in time for a game Saturday. A barn roof collapsed Wednesday night at an upstate New York dairy farm, trapping an unknown number of cows inside. The cost of snow clean-up has blasted holes in the budgets of many cities, states and counties, which were already struggling with the aftermath of the severe recession. Some places in the Northeast that have gotten more snow so far this winter than they usually get the whole season are running out of places to put it. In Portland, Maine, the downtown snow-storage area was expected to reach capacity after this week’s storm — the first time in three years that has happened. Snow totals in the Northeast hit their peak at several inches in New England, a far cry from the foot or more the region has come to expect with each passing storm in a season full of them. Meanwhile, the Midwest was reeling from the storm’s wallop as the system swept eastward. Tens of millions of people stayed home Wednesday. The hardy few Midwesterners who ventured out faced howling winds that turned snowflakes into face-stinging needles. Chicago’s 20.2 inches of snow was the city’s third-largest amount on record. Across the storm’s path, lonely commuters struggled against drifts 3 and 4 feet deep in eerily silent streets, some of which had not seen a plow’s blade since the snow started a day earlier. Parkas and ski goggles normally reserved for the slopes became essential for getting to work. The system was blamed for at least 12 deaths, including a homeless man who burned to death on Long Island as he tried to light cans of cooking fuel and a woman in Oklahoma City who was killed while being pulled behind a truck on a sled that hit a guard rail. Airport operations slowed to a crawl nationwide, and flight cancellations reached 13,000 for the week, making this system the most disruptive so far this winter. A massive post-Christmas blizzard led to about 10,000 cancellations. The airports with the most flight cancellations were Chicago’s O’Hare International, still feeling the impact of Wednesday’s blizzard, and Bush International in Houston, where freezing rain is forecast. Chicago public schools canceled classes for a second straight day. The city’s iconic Lake Shore Drive reopened before dawn Thursday after 34 hours; crews had worked overnight to clear snow and stranded vehicles. Drivers had abandoned hundreds of vehicles stopped in their tracks by snow that drifted as high as the windshields late Tuesday and into Wednesday morning. Some motorists came away angry, frustrated that the city didn’t close the crucial thoroughfare earlier. Others were mad at themselves for going out during the storm or not using another route. Utility crews raced to restore power to thousands of homes and businesses in Ohio, New Jersey and Pennsylvania, where freezing rain and ice brought down electrical lines. Rolling blackouts were implemented across Texas, including in Super Bowl host city Dallas, because of high demand during a rare ice storm. The outages would not affect Cowboys Stadium in suburban Arlington, said Jeamy Molina, a spokeswoman for utility provider Oncor. But other Super Bowl facilities, such as team hotels, were not exempt, she said. The storm derived its power from the collision of cold air sweeping down from Canada and warm, moist air coming up from the South. Weather experts said La Nina, a temperature phenomenon in the Pacific Ocean, also contributed. Snowfall totals this winter are off the charts along parts of the Interstate 95 corridor between Boston and Philadelphia. Newark, N.J., was hit with 62 inches of snow through Jan. 27, compared with the seasonal average of 25 inches. In New York City, 56 inches of snow has fallen on Central Park, compared to the 22-inch seasonal average. The Associated Press and Reuters contributed to this report. The former Vice President on Monday responded to Fox News Channel host Bill O’Reilly’s on-air question last week: “Why has southern New York turned into the tundra?” O’Reilly then said he needed to call Gore. “I appreciate the question,” Gore wrote on his website. 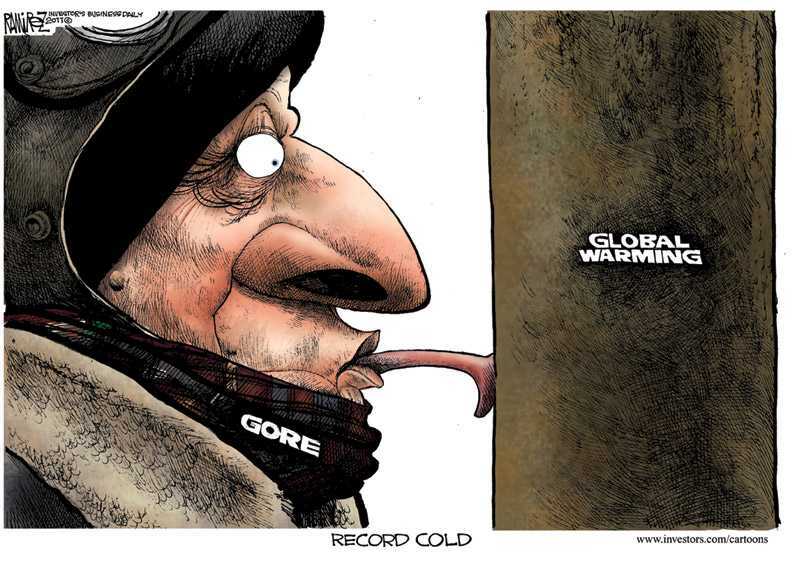 Gore then quoted an article by Clarence Page in the Chicago Tribune in early 2010: “In fact, scientists have been warning for at least two decades that global warming could make snowstorms more severe. Snow has two simple ingredients: cold and moisture. Warmer air collects moisture like a sponge until it hits a patch of cold air. When temperatures dip below freezing, a lot of moisture creates a lot of snow. The problem is that their claim is a complete lie. They NEVER predicted that global warming would create record cold until AFTER the cold blew their theory right out the door. Who does Al Gore quote? A scientist? Does he cite a major (or even a minor) study that shows that global warming would create more cold and worse snowfall? Does Al Gore even refer to his own film, An Inconvenient Truth, which liars rewarded his lies with a Nobel Prize? No. He cites as his source a liberal newspaper reporter who is making assertions AFTER THE FACT. Britain’s winter ends tomorrow with further indications of a striking environmental change: snow is starting to disappear from our lives. Sledges, snowmen, snowballs and the excitement of waking to find that the stuff has settled outside are all a rapidly diminishing part of Britain’s culture, as warmer winters – which scientists are attributing to global climate change – produce not only fewer white Christmases, but fewer white Januaries and Februaries. The first two months of 2000 were virtually free of significant snowfall in much of lowland Britain, and December brought only moderate snowfall in the South-east. It is the continuation of a trend that has been increasingly visible in the past 15 years: in the south of England, for instance, from 1970 to 1995 snow and sleet fell for an average of 3.7 days, while from 1988 to 1995 the average was 0.7 days. London’s last substantial snowfall was in February 1991. Global warming, the heating of the atmosphere by increased amounts of industrial gases, is now accepted as a reality by the international community. Average temperatures in Britain were nearly 0.6Â°C higher in the Nineties than in 1960-90, and it is estimated that they will increase by 0.2C every decade over the coming century. Eight of the 10 hottest years on record occurred in the Nineties. However, the warming is so far manifesting itself more in winters which are less cold than in much hotter summers. According to Dr David Viner, a senior research scientist at the climatic research unit (CRU) of the University of East Anglia,within a few years winter snowfall will become “a very rare and exciting event”. “Children just aren’t going to know what snow is,” he said. The effects of snow-free winter in Britain are already becoming apparent. This year, for the first time ever, Hamleys, Britain’s biggest toyshop, had no sledges on display in its Regent Street store. “It was a bit of a first,” a spokesperson said. Hey, kids. Do you have any idea what all those tons of cold white stuff that keep falling out of the sky is? Do you know what that smelly brown stuff that squirts out of the backsides of bulls is? Watch Al Gore’s movie, in light of reality. Tell me where you hear Al Gore’s pompous Vulcan voice explaining how warming will lead to more cold and more snow. What we kept hearing was that global warming would cause glaciers to melt and flood coastal cities populated by millions of helpless people. That turned out to be a whopping load of crap, just like everything else the left says. Glaciers are GROWING, not shrinking. And in fact they have been growing all over the world for some time now. Global warming alarmists are playing a game with the actual facts. In this game, they say things that completely discredit themselves. But instead of the critics of global warming getting any points, the global warmers raise their arms in victory as a touchdown appears in their column. You’ve got to know who these people are. They are God-despising pagan demon-possessed ideologues, not legitimate scientists or people who are about the truth. Global warming is a religion to them, as much as Christianity is a religion to me. You’ve got to know who these people are. For years they exaggerated the facts and the data to manufacture evidence supporting global warming. You’ve got to know who these people are. In emails to themselves they wrote about using tricks to make it appear that global warming is real. They openly acknowledged to one another that they were concealing evidence that they were manipulating the data (see also here). You’ve got to know who these people are. We find out that after massaging data for years to manufacture a bogus case, that they actually purged the raw data that would have proven how corrupt and dishonest they truly were and continue to be. The co-founder of Greenpeace says that the environmental movement was “hijacked by political and social causes of the left.” It’s far more about the socialist redistribution of global wealth than it is about any kind of actual science. And yet for some mysterious reason, even though all of it’s claims have been documented to be complete bunk, it’s viewed by the mainstream media as being more legitimate than ever. You are being lied to. If you watch mainstream media television such as NBC or CNN, or if you read newspapers such as the Los Angeles or New York Times, you are filling your soul with lies. And these lies have an agenda behind them. To the degree that these people are not deliberately lying, they are themselves deluded by a completely artificial and manufactured worldview – and even if you give them that much credit, they still routinely pick and choose stories, facts and sources to “shield” you from knowing what they don’t want you to know. Think of yourself as a sheep, constantly surprised by cold that, yes, we were told was a thing of the past. And now you are not only stupid, you are actually stuck in freezing cold hoping that somebody saves you before you die like a frozen fool. Now picture yourself in one of the electric cars that the left is trying to force-feed society – which makes your situation even MORE DESPERATE. Please quit being a fool and open your eyes to all the lies.